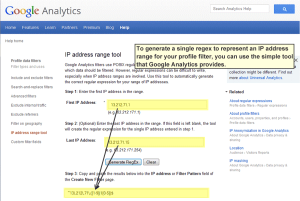 The Google Analytics IP range tool can help you set up an IP address filter for your profiles. As a best practice, your Google Analytics profiles should not display activity on your company’s website that originated from within your company. To exclude this traffic, you can apply a profile filter based on IP address. 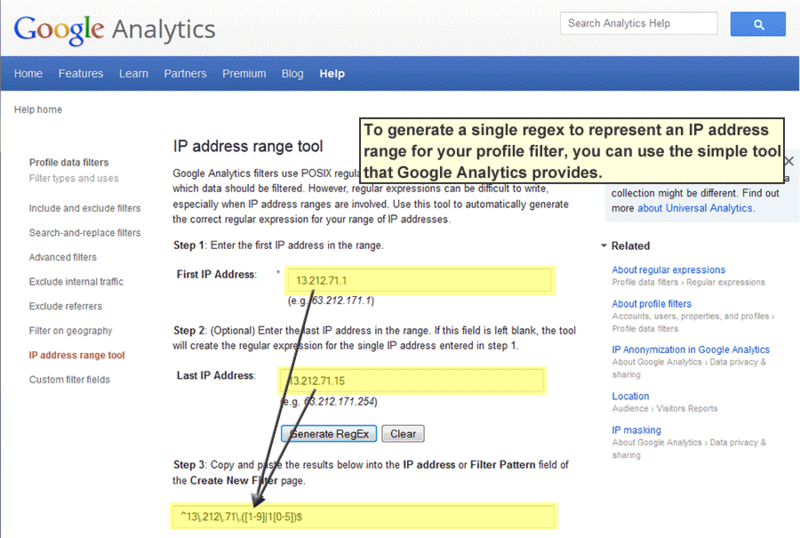 Since many organizations access the Internet through an allocated IP address range, Google Analytics has provided an IP address range tool that you can use to express an IP range as a single regular expression. You can ask your IT folks for the lower and upper bounds of your IP range, plug them into the tool, and then use the resulting regex as the Filter Pattern in your Exclude > IP Address profile filter. Two types of profiles that you should not apply this filter to are those that you are using for your development websites, since you’ll probably want to track internal activity there for testing purposes, and also your raw profile, which you should always maintain without any filters. Filtering activity from a single computer (in your home, for example) may actually be a little trickier, since many “standalone” computers dynamically acquire different IP addresses each time they access the Internet. If you can determine that your IP address is static, you can also set up a profile filter based on your single, static IP address.